Today’s card was made for a challenge over on the Dragons Lair Designs Fan Group. Each month we get given a digi stamp image for free to work with and we need to get a photo of what we make with the image uploaded to an album in the group by the end of that month. This month we were given a frame to work with. Which of course let it open to any Fan Group member who wanted to take part to decide what they’d use the frame for. 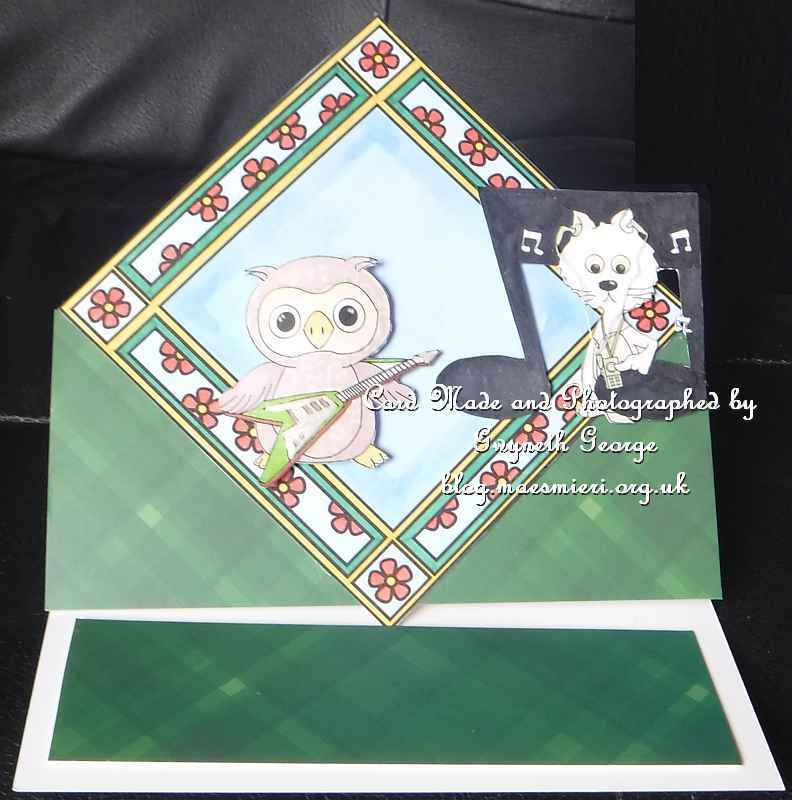 I chose to make a music themed easel card using a couple of other digi-stamps from the Dragons Lair Designs online store with the frame. Flower Design Frame – Freebie for any Dragons Lair Designs Fan Group member who wants to take part in the challenge. 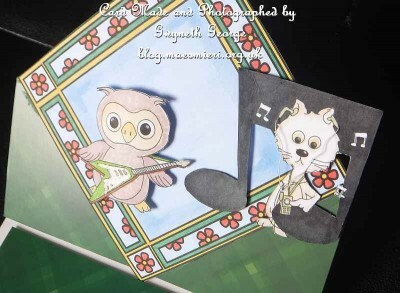 Cat with Music – previous freebie from Dragons Lair Designs Fan Group challenge. I put all three digi-stamps onto a single A4 working area and printed them out at the size I required. I then coloured them all in using Nuvo alcohol marker pens before cutting them out. Icouldn’t hope to cut out the thin lines of the whiskers and the wires from the cat’s MP3 player to his earphones, so I took a piece of sewing thread and used a needle to put it through the cardstock at the right places. I scored the cardstock at 6″ and 3″ and put the frame topper corner to corner along the 3″ line and marked the width. I then cut the card to this width before folding along the score lines. The piece trimmed off was further trimmed to fit on the inside as a stopper, holding it in place with foam tape. I used wet glue to attach half the frame to the folded over area of the card front and then used glue gel to attach the two other images to the front of the frame. You can just about see the thread on the cat from his MP3 player in this photo if you click and make it larger. If any of you want to join in this fun challenge then please do join the Dragons Lair Designs Fan Group and do so. There are a couple of other challenges currently running in the group as well. And please also join our “Anything Goes” challenge over on the Dragons Lair Designs Challenge Blog. And that is it from me for today. I hope that you will take advantage of the DLD Freebie and use it to make something that you connect up to the Sunday Showcase for us all to see. You never know, you could be the lucky one who wins more DLD goodies in the draw.